This weekend the Adirondack Winery is celebrating their 2nd anniversary and are holding various events in honor of the occasion. Last night, was a wine tasting and small, private party for their Inner Circle members. There was a vast spread of appetizers, desserts, dips and chocolate to pair with their wines. I’m not usually a fan of cheese fondue, but I literally couldn’t get enough of the one they made using their Gerwurztraminer wine and cheddar cheese. They suggested pairing it with their Gerwurztraminer or Orchard Blossom wines, but I enjoyed it with all the wines I slipped. You can bet the next time I have a party, I’ll be serving that fondue. Their finger-friendly desserts included amazing Stonewall Kitchen Raspberry Peach Champagne Jam Brownies and melt-in-your mouth chocolate prepared by Renee’s Chocolate Creations. Out of all the flavors, my favorite was the Belgian Dark Chocolate Bark, which they suggest pairing with their Red Barn, Cabernet Sauvignon, Calm After the Storm or Fireside Reserve. If you are in the Lake George area, make sure to stop by their store and tasting room in the heart of Lake George Village on Canada Street! They also ship to a limited number of states. 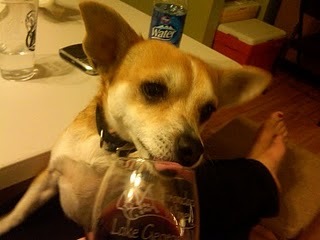 When I got home with a bottle of Red Barn, Blue Twilight and the dark chocolate, even the dog wanted in on some of the wine action. will have to stop by there on my way to saranac lake next time. i go right past lake george, but rarely stop. that fondue looks amazing – do you have the recipe? I went to the Saturday night event. I love this place! I drink thier wines all the time! I would definately suggest to anyone who has the chance to stop into Adirondack Winery to give thier awesome wines a try! I LOVE their wine, too! Sasha and Mike do a great job at the winery!